Amid reports of explosions just north of Windhoek in mid-November, Namibian authorities discovered a strange sphere in the village grasslands. 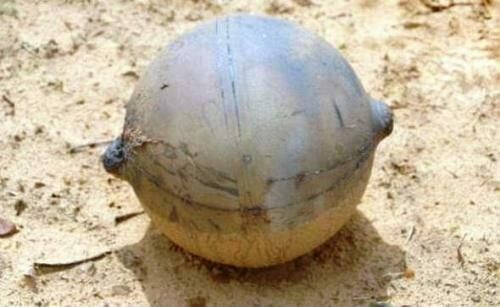 After initially approaching cautiously, scientists have begun to study the ball and have determined a few things: it is extraterrestrial and it is welded together. According to the first responders, the strange ball is is hollow, constructed of a rough metal alloy that is available on earth and is made of two metal halves welded together. It weighs 13 pounds with a diameter of 14 inches, and when it landed on the grassland of Namibia it created a crater 1 foot deep and 13 feet long before coming to a stop a full 60 feet from the place where it landed. Witnesses say they heard the sound of an explosion before the ball landed, which fits with the explanation that the ball reentered the atmosphere. Beside the sound of the ball hitting the ground, locals may have also heard a sonic boom as the object broke the speed of sound on its descent. Namibian police were baffled by the find, and NASA has taken over the study of the extraterrestrial sphere. NASA believes it to be what’s known as a “Composite Overwrapped Pressure Vessel” or COPV. COPVs are used to store gas under pressure while in space, and are made of extremely durable materials such as kevlar and carbon fiber. This is not the first time such and object has fallen to earth. Made to withstand the heat and pressure of reentry, two other COPVs have crashed to Earth recently; one in Australia in 2007, and another in Brazil in 2008. For NASA the ball is an example of a growing problem with space junk. Space debris has become an increasing danger to both space missions, and in the case of the falling COPVs, to the people who might be hit and killed by these small man-made meteors. It remains unknown from what spacecraft the COPV originated, and whether the Nambian government will want to keep ownership of the space trash that fell into their country.